A golden parachute in business is the name given to the clause in a top executive's employment agreement, or contract, that defines the payout the individual will receive should he or she be terminated or forced out of an organization before the end of their contract. For many top executives at larger firms, the potential payout indicated from the golden parachute can be substantial. Top executives are recruited to companies with an array of incentives and benefits, including base compensation, the potential for overblown bonuses, stock, stock options and the assurance that if their employment is terminated, they will not be financially disadvantaged. 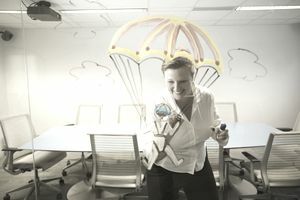 There are pros and cons to offering golden parachutes to executives. In the event of employee layoffs due to downsizing or a merger, organizations sometimes pay a severance or termination fee to employees. Common practices for severance payout range from one to two weeks of pay for every year the employee worked for the organization. Severance packages can extend to the executive ranks as well, with some executives offered six to twelve months salary and a pro-rated bonus in the event their employment is terminated. In contrast, golden parachutes are much larger and richer packages of benefits ranging from stock and option grants, multiple years worth of full compensation including bonuses, full vesting in retirement packages, and extended health care coverage. The golden parachute is called what it is because it provides a "soft landing" for a terminated executive. Golden refers to the fact that its money or other income. The differences between severance packages and golden parachutes are significant. The golden parachute is one way that organizations attempt to recruit high profile, experienced executives to their organizations. They are particularly common in situations where a firm is struggling and the board of directors believes that a highly skilled and successful leader is needed to stabilize and return the firm to a healthy financial position. Lure experienced and successful senior executives to the firm. Allay concerns or risks of failure. Armed with a golden parachute, an executive is free from concern over their job and can more easily focus on the hard work of improving the business. Minimize potential conflicts of interest. In the absence of a golden parachute, a CEO may be less inclined to pursue the right strategies or mergers that might potentially jeopardize his or her job. Ensure executive longevity essential for success with long-range strategies and ongoing improvement. The sheer size of the payout to terminated executives is often monumental, particularly when compared to the traditional severance agreements received by the rest of the employees during a layoff. This disproportionate treatment of one group versus another is viewed negatively by shareholders and employees. The agreements seem to reward failed executives for poor performance. In many high profile cases, an executive terminated for what can only be described as poor performance ends up receiving a veritable fortune via his or her golden parachute clause. This is viewed as irrational and unfair by shareholders and employees. In some cases, the executive may be fired for doing something unethical and still receive a rich payout via the golden parachute clause in their contract. In recent years, these lucrative and often loosely-defined agreements have come under increased scrutiny by shareholders and activist groups. Some high profile executives at leading companies have voluntarily eliminated the golden parachutes from their contracts, while others have reduced the size of the potential payout in the event of termination. Many others have incorporated ethics clauses and tightened up the parts of their agreement that reduce payouts when terminated for cause. Executives appreciate golden parachutes and the use of these compensation components offers some potential positives for all parties. However, the size of the potential payout and the conditions under which a golden parachute is triggered are both controversial topics in business.